Our annual state qualifying tournament. 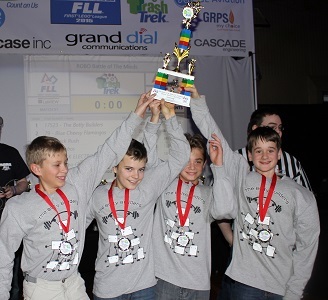 We are excited to yet again partner with Grand Rapids Public Schools and GRPS Robotics to offer an opportunity for kids in our West Michigan community to come together and compete in a FIRST LEGO League qualifying tournament. This year we will have up to 30 teams joining us for an opportunity to strut their stuff showing off their hard work in Robotic Design, Programming, and their Team Project. We are excited as this will offer up to 300 kids to compete along with their coaches and mentors, as well as welcome their families, friends, and community supporters to cheer them on. The competition will afford several outstanding teams an opportunity to advance to a FIRST in Michigan State Championship held in mid-December. Through our website, you can register your team and place your lunch order. Please contact us at registration@robobattleoftheminds.com if you have any questions. We look forward to seeing you there! For us to provide a quality event we need approximate 90 volunteers. This is an outstanding opportunity to have fun and make a difference for a number of kids from our community. Check out our volunteer page for additional information. We need you to make this event possible! No admission fees for public spectators. Please come out and cheer the teams on.